Ceela Offers Clean, a Cetaphil Cleanser Natural Alternative. that is completely acceptable to EWG, the watch dog of the cosmetic industry. No one offers a higher standard. 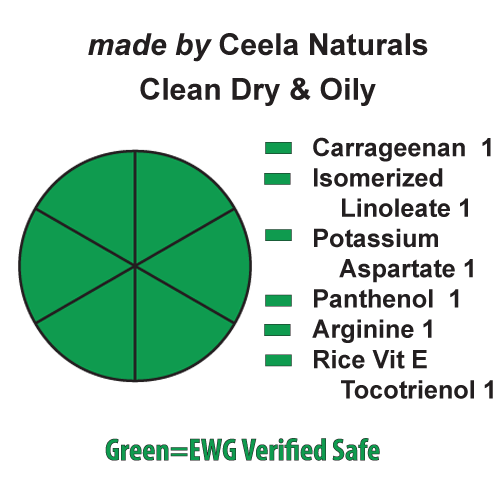 EWG grades Ceela’s ingredients as Green “Super” Safe (the best rating.) Cetaphil Cleanser has lesser ratings: Yellow “Watch-Out!” Safe, or Red “Run-for-the-Hills” Safe. Sodium lauryl sulfate is bad. Therefore, removing sodium lauryl sulfate from our skin care remains the chief educational objectives of cosmetologists and estheticians across the world. We at Ceela know this detergent has many good uses, but not in ordinary skin care. Urban legends suggest SLS (aka SDS) began as garage floor cleaner. Few detergents can cut grease or cause an allergic response better than SDS or SLS. SLS is the prime ingredient in laundry detergents advertised as “plant based”. This usually means coconut or palm oil is the primary plant source. These two oils contain significant percentages of Lauric Acid, the plant fat used to make sodium lauryl or laureth sulfate. We really need a Cetaphil Cleanser natural alternative. SLS makes abundant lather. However, the longer fats Ceela uses do not lather well. If you see a product with lots of lather and bubbles, you probably have a detergent like SLS. The other two “short chained” fatty soaps include myreth, myristic, palmeth, palmitic fats. Cetaphil contains these fats and we do not believe that Cetaphil is a natural alternative. Conjugated linoleic fats are natural anti-microbials. These have strong anti-staphylococcal and some anti-fungal capacity. This makes the cleansers made from such fats, like Ceela Clean, super powerful. Mixed within Ceela Clean you will find oils that are very important to our skin. Washing with Clean can restore oils, necessary for beauty. Ceela Clean supplies important ingredients found within our body, truly a natural alternative to Cetaphil Cleanser.